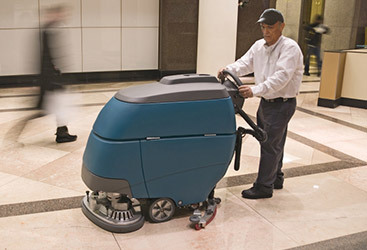 Enviroclean USA LLC’s green cleaning platform in Atlanta provides the highest level of service by implementing a LEED certified janitorial program that improves indoor air quality, minimizes consumption of cleaning materials used in cleaning processes, decreases water consumption up to 80% and lessons the burdens placed on natural systems by using non-toxic, green seal certified chemicals. Green Cleaning: Cleaning for better health with transparent procedures and tools, equipment, and chemicals that are derived from more sustainable sources and have a significantly reduced impact on people, building users, building occupants, other living things as well as the environment. electricity with our “lights out” policy and CRI certified equipment; we divert waste from landfills via recycling programs and composting programs. The use of microfiber hand towels decreases waste. Overall, we help decrease our customer’s operational costs significantly—delivering savings. environment and your employees on the market. 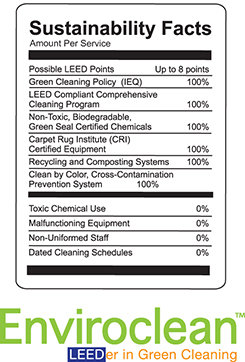 All of the chemicals including disinfectants, restroom cleaners, heavy duty cleaners, glass cleaners, carpet cleaning solutions, etc all meet Green Seal Certification which is a non-profit organization that awards certification to products that safeguard the environment. 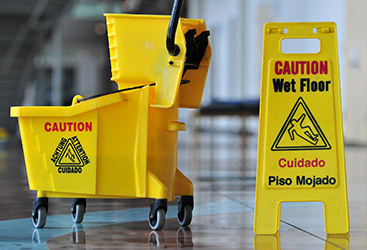 Our full product line of chemicals that will be used in your facility along with their corresponding MSDS sheets will be supplied upon request and will be located in janitorial closets or storage areas. to assist with waste minimization and landfill diversion.